eBay E&K Sun Rise Inc 5 Mils Blue Multi-purpose Waterproof Poly Tarp Cover Tent Shelter Camping Tarpaulin DescriptionFeatures:Lightweight tarp easy to handleRust proof grommets approximately every 3 ft(36'' inch apart)..UV, Waterproof, Rot, Rust and Mildew resistantHigh-density polyethylene fabric that is tear resistantPlastic with built in ultraviolet sun protectionideal for substantial household projectsconstruction, boating, camping, landscaping and roofWater, mildew and tear resistant.Roofing projectsSun and fade resistantProvides good tensile strength and tear resistanceGeneral Cover TentCar CoversLumber CoversBoat CoversMachine CoversCamping Ground SheetWind ProtectorsPrivacy WallsPicnic MatsPool CoverHaystack CoverPackage Contents:1 x TarpThis all-purpose blue Poly Tarp is ideal for many applications including: construction, boating, covering firewood,camping , landscaping, roofing, painting and many others. This Ultimate Poly Tarp is made of woven reinforced polyethylene fabrics with a double laminated coating adding extra strength. 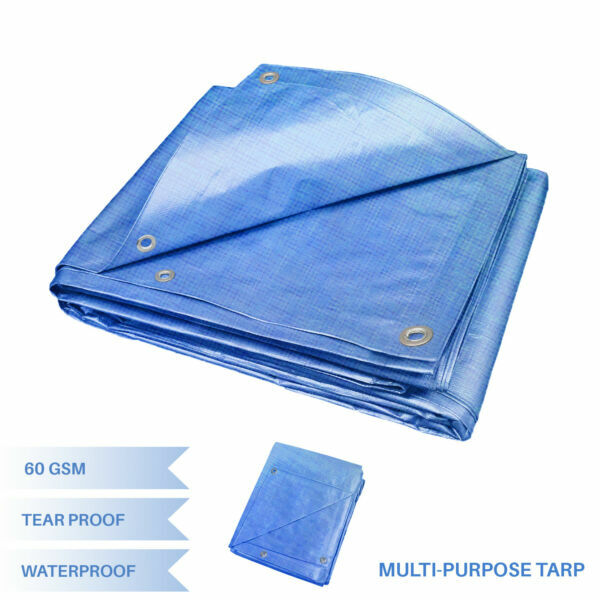 The Ultimate PolyTarp has heat sealed seams to prevent leaks and tears, as well as being sun and fade resistant. The Ultimate Poly Tarp also features rope reinforcement with grommets placed every 3 ft.About UsWelcome to our E&K Sun Rise eBay store. Our company is specialized in Home Garden, Patio Awning, Sun Shade Sail and Privacy Fence Screen Products. We believe that it is our vision and mission to provide innovative products with best service and competitive price to satisfy you. Our goal is to make sure that you can find exactly what you are looking for and make it easy for you to place your orders.Payment·We accept PayPal payment only·Payment should be completed within 7 (Seven) days of auction closing. Or unpaid dispute will be filed for closing auction.·We will leave a positive feedback immediately after payment is received. We appreciate a positive feedback as much as you do. If for some reason there is any issue with the purchase, please contact us prior to leaving feedback, and we will be glad to work with you to have it resolved.Shipping1,Package handling only takes 2-3 business day at our warehouse, so please make sure entering correct payment and shipping information before checking out. Once your payment is completed, please inform us by phone or leave eBay note if the changes are needed before we send the product. If you have any changes, Please inform us ASAP. 2,If an address change is needed, you will be responsible for any fees associated in the condition that you contact us after we ship your item.3,Truck company: 3-10 business days. USPS: 2-10 business days. UPS/FEDEX: 3-9 business days.Ship within USA only, NO international shipping! Free Shipping (USPS or UPS) within the 48 Contiguous United States. No P.O. Box Delivery (Our Product size is too big to fit in PO Box)Returns1,All of our items come with a 30-day return policy. We ensure all our items are new and in excellent condition prior to shipping. In the event that you receive the item that is not to the standards above, please contact us via e-Bay messages. All returns must be in new original condition as received and should be shipped with delivery confirmation.2,Please note that all returns must be pre-approved by E&K Sun Rise Customer Service Teams. Unauthorized returns will not be accepted. If you need to return, please check twice to confirm the item not work and contact our customer service representative, let us know the detailed problem and send us some pictures for confirmation.3,We ONLY accept the return for original package. Please make sure that item has NO man-made sabotage. Used items will not be accepted for return.4,We reserve the right to refuse any returns for objective reasons.Contact UsIf you have any questions or concerns about the product or the auction, please contact our customer service department by sending us a message on eBay my messages or click on the Contact Seller page. We will give you a response in 24 -48 hours.Customer Service Supports available : 9:00 Am - 5:00 Pm PST Monday-FridayAll emails will be responded to within 24-48 hours excluding Holidays and weekends.